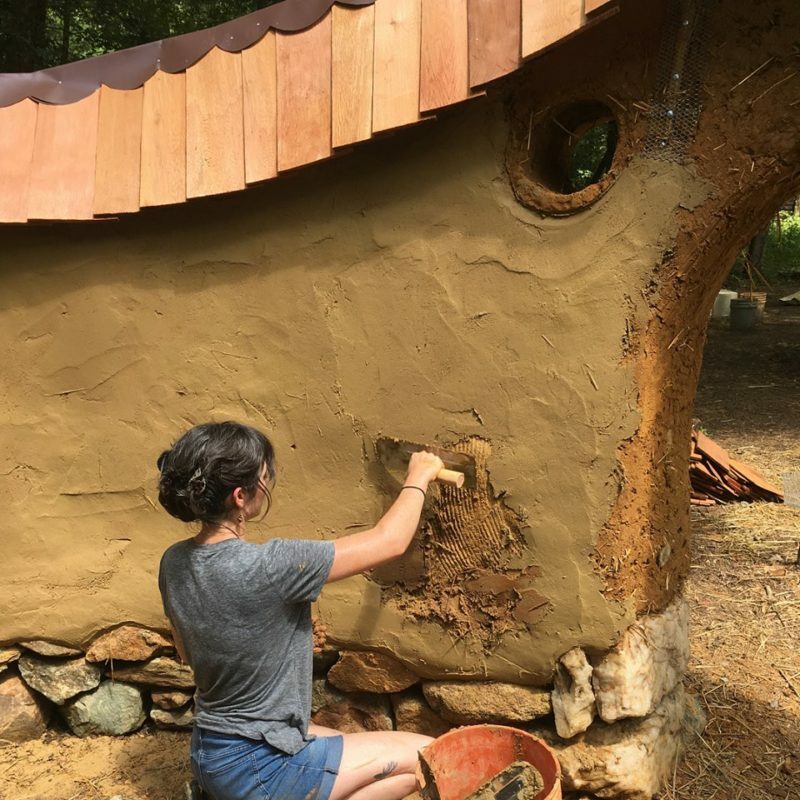 Cob Workshops Upcoming Events : : COB, BaleCob, Light Straw Clay Extravaganza! COB, BaleCob, Light Straw Clay Extravaganza! 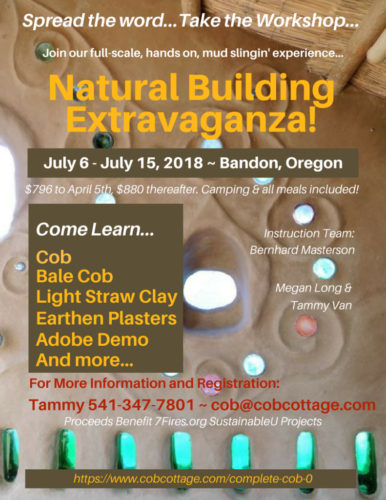 Join us in Oregon at our beautiful Bandon-by-the-Sea location for a 9-day intensive, for another great Natural Building Extravaganza! In this expanded version of our most popular program ever, we will take the ground out from under your feet and turn it into a versatile medium to teach you to sculpt a garden wall or even a whole house. The primary focus of the course will be completing a tiny cob/balecob cottage from start to finish. In addition, we will introduce you to an array of other natural building wall systems such as adobe and light straw clay and show you how to merge these natural building materials to remodel, insulate, and add to existing wood framed buildings and an old metal mobile home! Earthen plasters will also be discussed and demonstrated. (Please note that the foundation for the cottage we will build will be completed prior to the workshop. However, we will learn the components of its construction and do a hands-on foundation for a future building together. If you would like to volunteer to help us with the cottage’s foundation prior to the workshop, please let us know). You will learn construction of cob walls, framing-in of doors and windows, artistic details and some finish work too. We will have daily discussion time for siting/design, rubble trench and poured foundations, roofing options, passive solar, plasters and whatever else we can share! 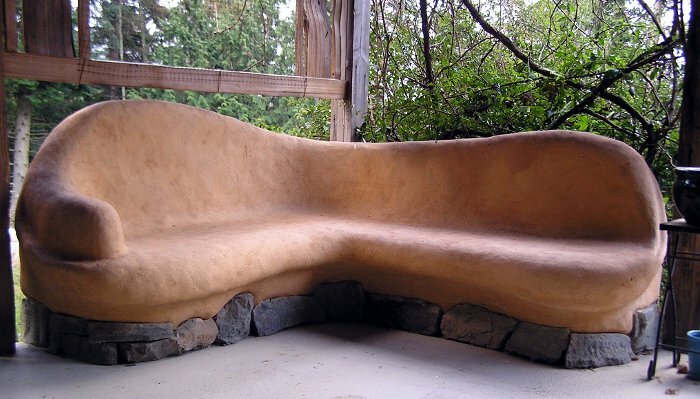 In addition to our time in Bandon, the course will include an extensive tour at our Cob Cottage complex in Coquille, where you will meet Linda Smiley and Ianto Evans, trailblazers in the North American natural building movement. Bernhard Masterson is our lead instructor, and he is one of the best! Bernhard has been building and teaching natural building and alternative building design for more than 15 years in the Pacific Northwest, through Cob Cottage Company, Pacific University, Portland and Clackamas Community Colleges, Village Building Convergence, and independent workshops and contracts. He has built and lived in several cob and strawbale homes. In addition, Bernhard has played a significant role in efforts to incorporate natural building materials and designs into building code. Megan Long is a world traveler and natural builder. She was one of our interns two years ago who successfully transformed an old 1950’s trailer into a natural building piece of art! Megan’s passions are teaching yoga and sustainable living on all levels, including natural home construction. Tammy Van was the Office Manager for Cob Cottage Company for 4 years. She is now the Cob Cottage Company online Coordinator and world-cob-networker, and has co-instructed workshops with various instructors including three in Bandon with Bernhard! She is your host, and the founder of the SustainableU program. Our team will also include Miguelito and Adrianna, our amazing cooks who come all the way from the Mexican Baja to make sure you are well fed three meals a day. They have cooked for over ten cob workshops and large groups. There is not enough we can say about them and their amazing skills. You will NOT be hungry, and everyone will have an opportunity throughout the week to work with them in the kitchen to learn some of their tasty secrets, a highlight of the week for many! We will also be joined by Bob Van who makes it all happen behind-the-scenes, making sure the material components are ready when we are and happy to share woodworking, electrical, plumbing and patience with anyone wanting to learn. Our onsite interns and residents will help along the way, share knowledge and inspire others with their own life’s journeys. Here at the SustainableU complex in Bandon, Oregon we continue to build infastructure for a growing sustainable education center. Currently there are seven cob buildings and a large cob courtyard gathering space; two community space buildings remodeled with natural materials including cob, balecob, light straw clay, adobe and strawbale; and a large communal kitchen made of balecob and load bearing strawbale. This year’s project will be an addition to a trio of small studio buildings. 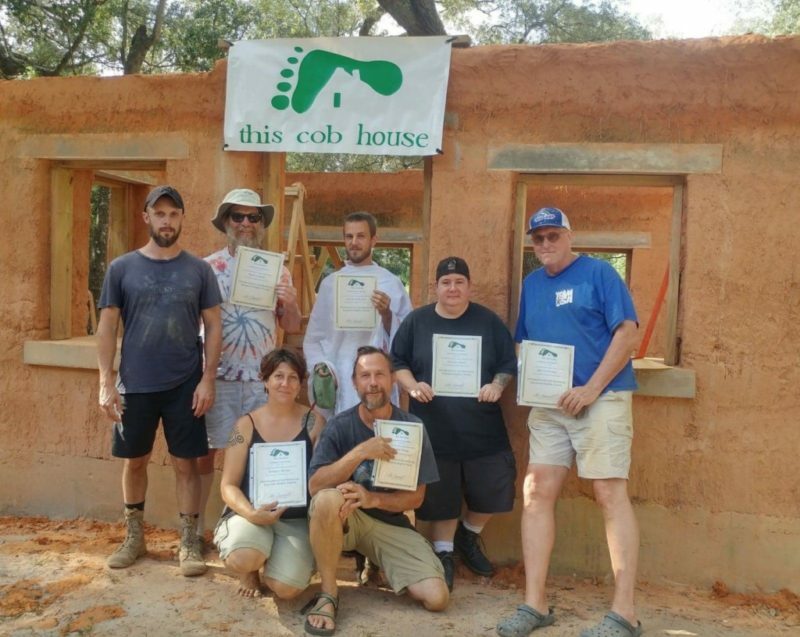 This is not just an opportunity to learn cob and natural building but to co-create something even greater for the future good of those who come next. Your participation in this project will continue to inspire others for years. You are not coming to just learn ABOUT cob and natural building, but learning FROM cob and natural building. We hope you can join us. Space is limited to allow personalized hands on instruction and this Extravaganza always books early! So register soon! Registrations before April 5th save 10%. After April 5th the full price goes into effect at $880. Tuition includes all meals and camping on site.